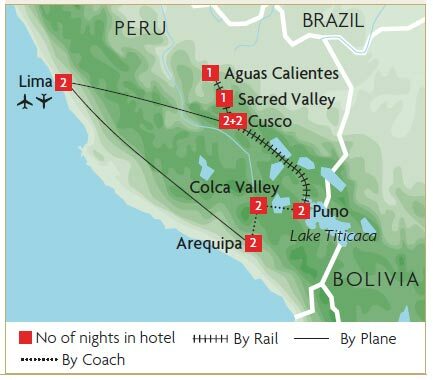 The Andean Explorer is a classic train journey that connects Puno on the shores of Lake Titicaca to Cusco. This was the legendary route taken by Manco Capac, the first Inca ruler, who is said to have risen from the waters of Lake Titicaca and founded the Inca Empire under instructions from the Sun God. After leaving Puno, the train travels along the desolate and dusty altiplano, where llama, alpaca and vicuna graze underneath the snow-capped Andean peaks. The highest point on the journey is Le Raya Pass at 4,321 metres where the train makes a 20 minute stop to allow you to experience the high altitude climate while local traders sell textiles made from soft alpaca wool. The scenery then changes with fertile valleys worked with traditional agricultural methods. Along the way you pass the Inca ruins at Racchi, where the Temple of Viracocha is one of the biggest buildings the Incas constructed. You'll arrive in Cusco after a journey of 282km taking approximately 10 hours. There are two classes on the train - Backpacker and Andean Explorer (first class). The lost city of Machu Picchu and the treasures of Peru are unveiled in this high-altitude adventure, combining scenic rail journeys with first class hotels. An unforgettable experience from start to finish includes Lima, Arequipa, Lake Titicaca and Cusco.